Feed grains today, unless they are certified organic or GMO-free, are contaminated with GMOs and glyphosate. 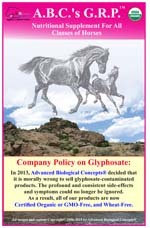 Glyphosate contamination is known to tie-up minerals and to disrupt the normal activity of the beneficial intestinal bacteria, resulting in a variety of health problems in animals. A.B.C. 's G.R.P.™ is A.B.C's Plus® Organic with added GRP™ technology. It is a nutrient pack for digestive microflora, used for holistic disease prevention. The ingredient list reflects ingredients that are cultivated by fermentation, yielding nutrient specific enzymes, substrates and stabilized bacteria. A.B.C. 's G.R.P.™ allows for increased absorption of all nutrients, even those naturally occurring nutrients contained within your water, hay and other food sources. If fed with other supplements, the absorption is maximized for optimum assimilation. A.B.C. 's G.R.P.™ aids in the development of muscle and skeletal tissues including hair coat and hooves. A.B.C. 's G.R.P.™ is a supplement for the digestive system and is coactively supportive of immunity. The nutrients contained support the tissues of the digestion system and assist with creating a healthy digestive environment. The nutrients contained do not meet daily nutritional requirements for your horse. **Multi-Bag Discount on 2 or more 25 lb bags!